Discover—or revisit—the enchanting world of the Sandleford Warren rabbits in this first-ever illustrated edition of a celebrated modern classic. A phenomenal worldwide bestseller for almost forty years, Richard Adams’s Watership Down is a timeless classic and one of the most beloved novels of all time. Set in England’s Downs, a once idyllic rural landscape, this stirring tale of adventure, courage, and survival follows a band of very special rabbits on their flight from the intrusion of man and the certain destruction of their home. Led by a stouthearted pair of brothers, they journey forth from their native Sandleford Warren through the harrowing trials posed by predators and adversaries, to a mysterious promised land and a more perfect society. A book that speaks to our society as vividly as it did nearly half a century ago, this keepsake Scribner Classic edition showcases more than twenty sumptuous, evocative tip-in paintings from Aldo Galli, an illustrator chosen by Richard Adams himself. Why do you cry out thus, unless at some vision of horror? The house reeks of death and dripping blood. How so? ’Tis but the odor of the altar sacrifice. The stench is like a breath from the tomb. The primroses were over. Toward the edge of the wood, where the ground became open and sloped down to an old fence and a brambly ditch beyond, only a few fading patches of pale yellow still showed among the dog’s mercury and oak-tree roots. On the other side of the fence, the upper part of the field was full of rabbit holes. In places the grass was gone altogether and everywhere there were clusters of dry droppings, through which nothing but the ragwort would grow. A hundred yards away, at the bottom of the slope, ran the brook, no more than three feet wide, half choked with kingcups, watercress and blue brooklime. The cart track crossed by a brick culvert and climbed the opposite slope to a five-barred gate in the thorn hedge. The gate led into the lane. The May sunset was red in clouds, and there was still half an hour to twilight. The dry slope was dotted with rabbits—some nibbling at the thin grass near their holes, others pushing further down to look for dandelions or perhaps a cowslip that the rest had missed. Here and there one sat upright on an ant heap and looked about, with ears erect and nose in the wind. But a blackbird, singing undisturbed on the outskirts of the wood, showed that there was nothing alarming there, and in the other direction, along the brook, all was plain to be seen, empty and quiet. The warren was at peace. At the top of the bank, close to the wild cherry where the blackbird sang, was a little group of holes almost hidden by brambles. In the green half-light, at the mouth of one of these holes, two rabbits were sitting together side by side. At length, the larger of the two came out, slipped along the bank under cover of the brambles and so down into the ditch and up into the field. A few moments later the other followed. The first rabbit stopped in a sunny patch and scratched his ear with rapid movements of his hind leg. Although he was a yearling and still below full weight, he had not the harassed look of most “outskirters”—that is, the rank and file of ordinary rabbits in their first year who, lacking either aristocratic parentage or unusual size and strength, get sat on by their elders and live as best they can—often in the open—on the edge of their warren. He looked as though he knew how to take care of himself. There was a shrewd, buoyant air about him as he sat up, looked round and rubbed both front paws over his nose. As soon as he was satisfied that all was well, he laid back his ears and set to work on the grass. His companion seemed less at ease. He was small, with wide, staring eyes and a way of raising and turning his head which suggested not so much caution as a kind of ceaseless, nervous tension. His nose moved continually, and when a bumblebee flew humming to a thistle bloom behind him, he jumped and spun round with a start that sent two nearby rabbits scurrying for holes before the nearest, a buck with black-tipped ears, recognized him and returned to feeding. The small rabbit came closer to his companion, lolloping on long hind legs. He led the way down the slope, his shadow stretching behind him on the grass. They reached the brook and began nibbling and searching close beside the wheel ruts of the track. It was not long before Fiver found what they were looking for. Cowslips are a delicacy among rabbits, and as a rule there are very few left by late May in the neighborhood of even a small warren. This one had not bloomed and its flat spread of leaves was almost hidden under the long grass. They were just starting on it when two larger rabbits came running across from the other side of the nearby cattle wade. “Fiver found it, Toadflax,” said Hazel. Fiver had already turned away. Hazel caught him up by the culvert. “You don’t suppose I’ll leave you to look after yourself, do you?” said Hazel. “But to tell you the truth, I sometimes feel like clearing out of this warren altogether. Still, let’s forget it now and try to enjoy the evening. I tell you what—shall we go across the brook? There’ll be fewer rabbits and we can have a bit of peace. Unless you feel it isn’t safe?” he added. The way in which he asked suggested that he did in fact think that Fiver was likely to know better than himself, and it was clear from Fiver’s reply that this was accepted between them. They ran over the culvert. The grass was wet and thick near the stream and they made their way up the opposite slope, looking for drier ground. Part of the slope was in shadow, for the sun was sinking ahead of them, and Hazel, who wanted a warm, sunny spot, went on until they were quite near the lane. As they approached the gate he stopped, staring. A little way in front of them, the ground had been freshly disturbed. Two piles of earth lay on the grass. Heavy posts, reeking of creosote and paint, towered up as high as the holly trees in the hedge, and the board they carried threw a long shadow across the top of the field. Near one of the posts, a hammer and a few nails had been left behind. The two rabbits went up to the board at a hopping run and crouched in a patch of nettles on the far side, wrinkling their noses at the smell of a dead cigarette end somewhere in the grass. Suddenly Fiver shivered and cowered down. He began to whimper with fear. He ran down the field and over the brook to the cattle wade. Here there was a delay, for Fiver—surrounded on all sides by the quiet summer evening—became helpless and almost paralyzed with fear. When at last Hazel had got him back to the ditch, he refused at first to go underground and Hazel had almost to push him down the hole. THIS IDEALLY SITUATED ESTATE, COMPRISING SIX ACRES OF EXCELLENT BUILDING LAND, IS TO BE DEVELOPED WITH HIGH CLASS MODERN RESIDENCES BY SUTCH AND MARTIN, LIMITED, OF NEWBURY, BERKS. † Nearly all warrens have an Owsla, or group of strong or clever rabbits—second-year or older—surrounding the Chief Rabbit and his doe and exercising authority. Owslas vary. In one warren, the Owsla may be the band of a warlord: in another, it may consist largely of clever patrollers or garden-raiders. Sometimes a good storyteller may find a place; or a seer, or intuitive rabbit. In the Sandleford warren at this time, the Owsla was rather military in character (though, as will be seen later, not so military as some). Richard Adams, the son of a country doctor, was born in Newbury in England in 1920. He was educated at Bradfield College and Worcester College, Oxford. He served in the Second World War and in 1948 joined the civil service. In the mid-1960s he completed his first novel, Watership Down, for which he struggled for several years to find a publisher. It was eventually awarded both the Carnegie Medal and the Guardian Award for children's fiction for 1972. In 1974 he retired from the civil service and published a series of further books, including Shardik, Tales from Watership Down, Maia, The Plague Dogs, and The Girl in a Swing. Adams died on Christmas Eve, 2016. 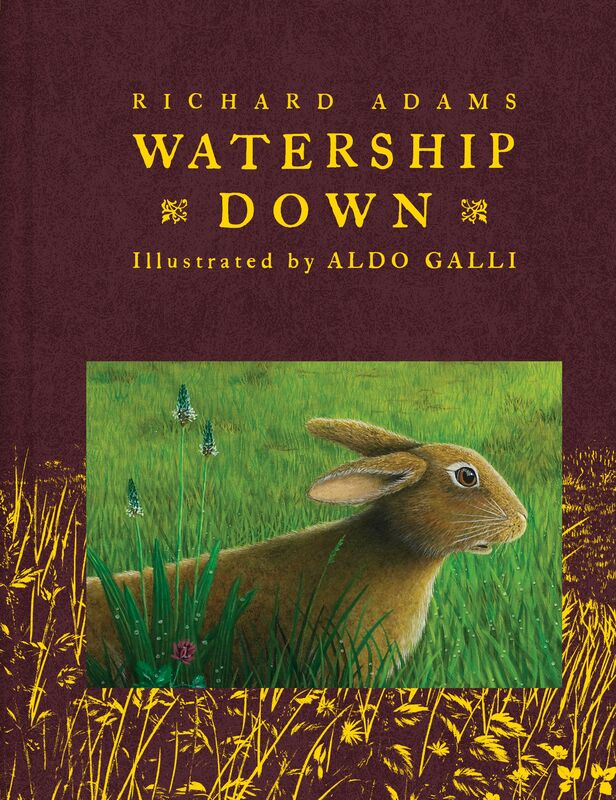 To capture the feeling of the verdant English landscape in Richard Adams's "Watership Down" (Atheneum, 496 pages, $29.99), first published in 1972, Aldo Galli painted in the real locations described in the story. In his finely wrought illustrations, the rabbits Hazel and Pipkin crouch beside the real Nuthanger Farm and Hazel, Bigwig and Fiver make their way across the real Hampshire downs. Mr. Galli brings a sense of intensified realism to his depictions in this 40th anniversary edition. Foliage is luxuriantly, impossibly green, and the edges of things—the feathers of birds, the fluff of dandelions—look as sharp as if they were cut from glass. As a gift, this edition would suit anyone over the age of 10, including adults.